https://cdn2.hubspot.net/hubfs/644585/bio-whitepapers/NXCLIN~3.jpg Explore the use of LogR and B-allele frequency values from SNP arrays to interpret the underlying biology of tumor samples, along with limitations of this approach. Tumor samples, especially solid tumors,often contain a mixture of both aberrant tumor cells and non-aberrant normal cells. 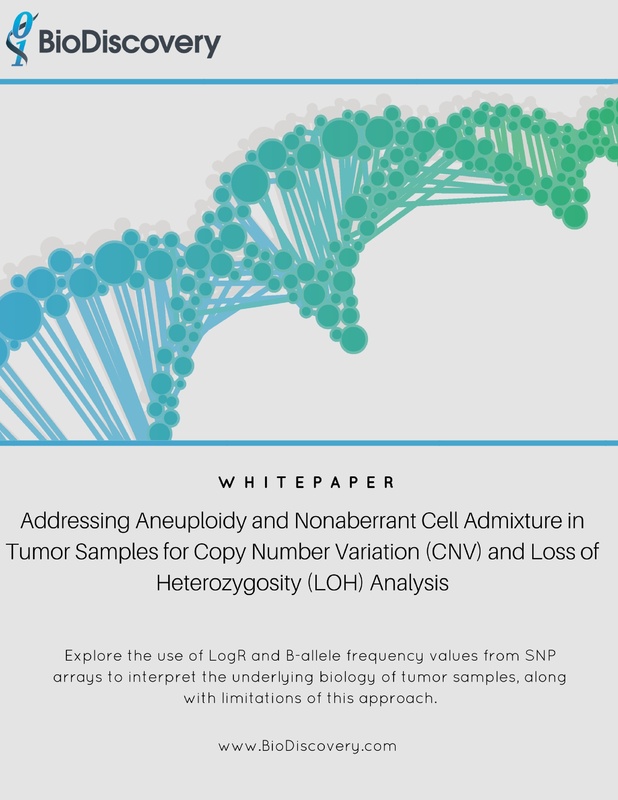 This whitepaper explores the use of LogR and B-allele frequency values from SNP arrays to interpret the underlying biology of tumor samples,along with limitations of this approach. It also reviews the ASCAT algorithm and its use when matched-normal samples are available. The Log Ratio (LogR)at a particular position on the genome is calculated by using a probe to take the signal intensity of the sample at that position and dividing it by the signal intensity for a reference sample at the same position. Using “2-color” array technology, the same probe is used to simultaneously measure the signal for the test and reference samples using a competitive hybridization approach. Many arrays, including most SNP array platforms,use a single color approach.In this case, the reference DNA signal is provided ‘off chip’, and the data is normalized to this off-chip reference.Since there can be systematic biases coming from measurements made of the sample vs. the reference (e.g.,a brighter laser is used for one channel vs. the other),a normalization step is necessary. One common method for this normalization is to adjust the LogR value of the median probe to zero(so there would be equal number of probes above and below the zero line). This method works quite well if the there are few and small aberrations in the test genome.By centering the diploid region of the sample at “0” on the LogR scale, copy number gains or losses can be detected by shifts in amplitude.However, using this value alone has some limitations when there are significantly large genomic changes (as in many cancers and highly aneuploid samples). Array platforms with SNP probes can be employed to address some of the above limitations. In the example, below, each panel represents a different underlying biological event.